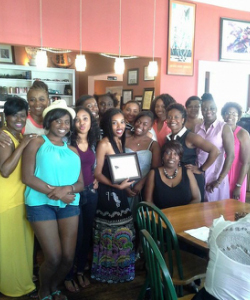 The Decatur-DeKalb Chapter of the National Coalition of 100 Black Women established a leadership program for young women entitled, The Legacy Program in 1996. The name was chosen to reflect our commitment to passing on to subsequent generations of African American women the rich history and significant contributions made by African American women who have preceded them. The program is designed to establish an enhanced sense of self-esteem and personal motivation among young African American women that will inspire them to develop the necessary skills needed to assume a wide range of leadership roles in areas such as politics, civic affairs, business, entrepreneurship, education, health and medicine, religion, and international affairs. The Legacy Program targets 9th through 12th grade female high school students in DeKalb county. Participants must be committed to the goals of the program and willing to assume an active role in the program. We encourage our Legacy girls to remain in the program through high school. They are also invited to support Legacy after they graduate. This commitment also includes attending all Legacy program meetings and carrying out all assignments required for the program modules.